I hope you're not tired of looking at flower photos. I know I have shared a lot of them lately but I just can't help myself. I love flowers and love photographing nature....so you guys get to look at them. 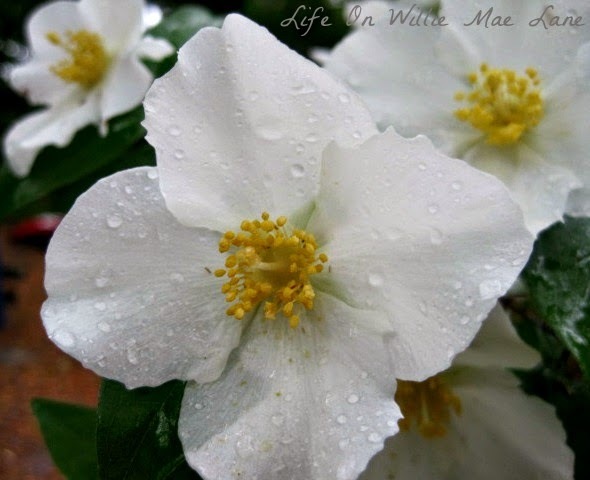 These white English Dogwood blossoms are one of my favorites every year. 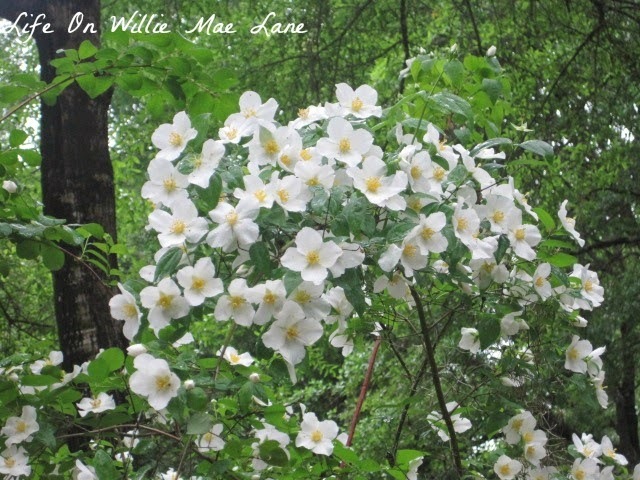 They are a tall bushy plant and when they are blooming, it looks almost like it has snowed on them! They don't last too long so I enjoy them while I can. A few days ago, I stopped by my mom and dad's place to get some potting soil. My kinders planted seeds to take home for Mother's Day in a few weeks. They are so excited that they sprouted over the weekend and they have seedlings now! 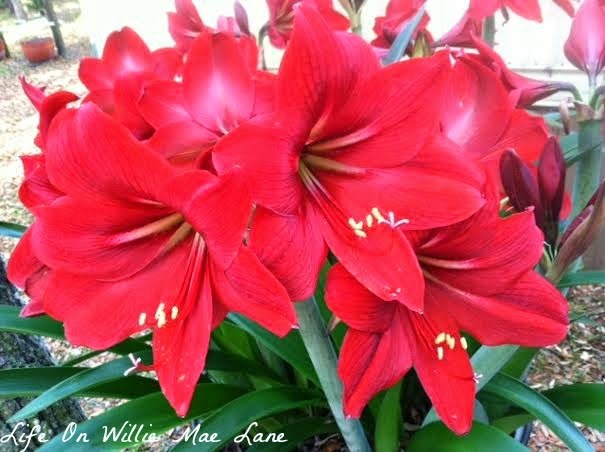 Anywho, I had to snap a few photos of mama's gorgeous lilies while I was there! 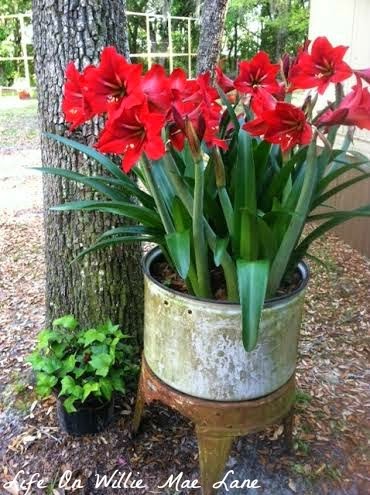 If you are looking to plant some flowers that make a statement....these are perfect! They are huge blooms....bigger than a saucer but a little smaller than a dinner plate. They are planted inside an old tub out of a washing machine. My washer bit the dust a while back and we saved it just to take the tub out of it. I may just plant lilies in mine next year. 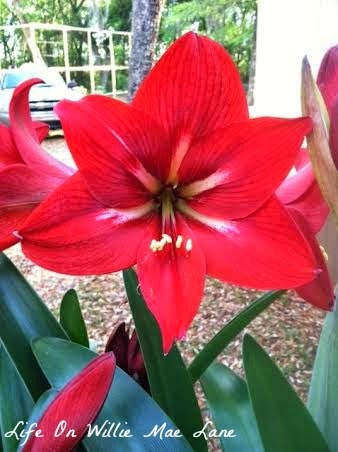 Last year she had over 50 blooms and this year it looks like it will be over 50 again before they stop blooming. 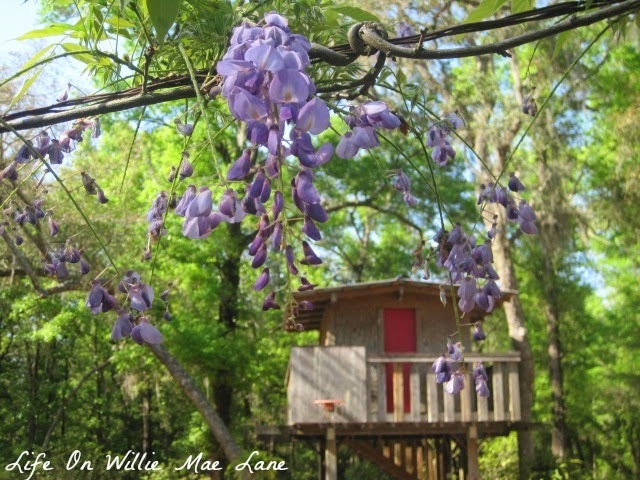 I love the wisteria blooms too. The lavender color is just gorgeous! Mama planted some of the seed pods and is going to share with me. The little house on stilts in the background is the playhouse daddy built for all the grandchildren years ago. Most of them have long outgrown it, but one day there will be great-grands to play in it. There's a basketball hoop on the front and swings and a slide underneath. Such delicate blooms...too bad they don't last longer. They sure put on a spectacular show while they are in bloom though. Sorry I haven't had anything crafty or creative to share lately. I have been really busy with work lately...it's testing season (insert frownie face here!) We test these kids to death in my opinion! My teacher/retired teacher friends know what I am talking about. I am really hoping to get creative this weekend....we shall see...:) Have a wonderful Wednesday my friends. Testing! The bane of a teacher's existence. Love looking at your blooms - especially since mine were demolish in last night's wind and thunderstorms. I am interested in your father's watering system - does he depend on collecting rain for his containers? My husband is going to hunt you down for giving me the idea that I MUST have a washer tub for the garden this year! I love seeing the blooms. Thanks Lynn! I'm happy to hear you enjoy them! Beautiful! 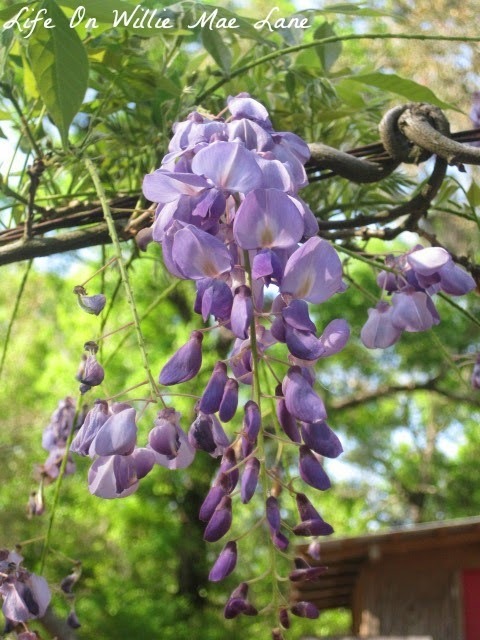 I love the wisteria! I love all flowers!!! Don't worry, I don't think I can ever get tired of seeing flower photos especially yours :) It's nice to visit you and see such beauty - thanks for sharing, my friend! The lillies are amazong, and love the tub. 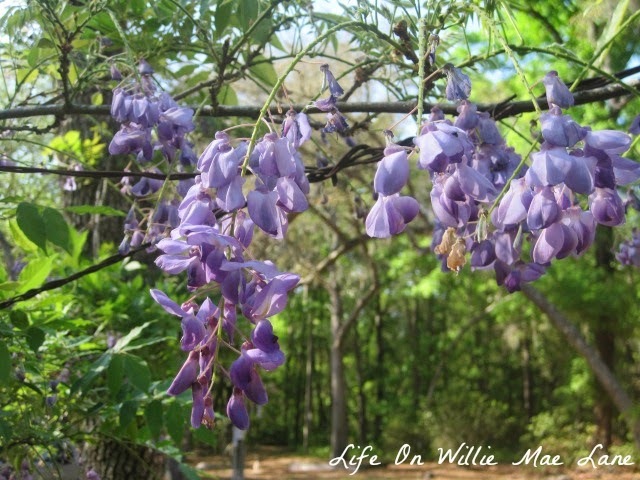 Wisteria has long been a favorite of mine. 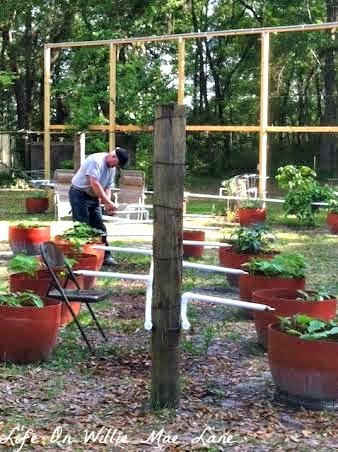 Sweet playhouse and love your Dad's watering system, so great. Fun and beautiful post Vicky! WOW! Those lilies are amazing! Your parents seem to have quite the green thumb. :) We grow such different types of flowers here where I live, nothing like you have. Beautiful photos and lovely visit today. Thank you. I love flowers. Those white flowers are amazing. I have to check for the French name to see if I can grow them here. The wisteria is lovely. I hope you'll get trhough that testing week... I'm so over marking papers!